Some pictures and videos of hunting results. 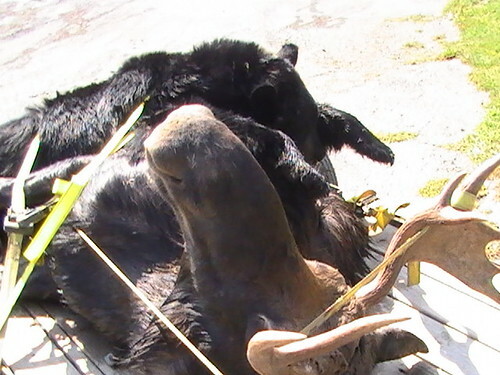 This is a quick video of the conclusion of our Moose Hunt 2008. Thanks for watching. 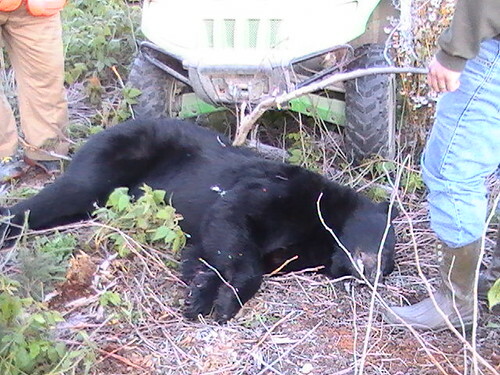 This is a picture of our hunt today, Sept 22, 2008, we set out to get a bull moose and came home with a 300 pound bear. 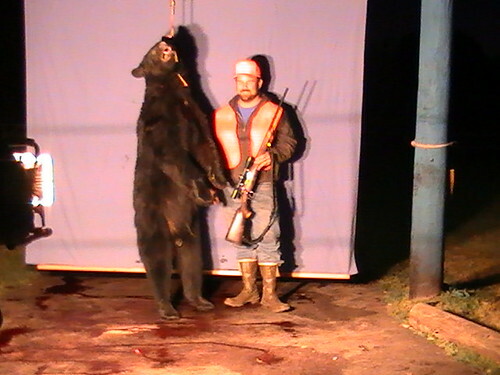 Jim shot this bear from about 250 yards with his new custom built 338-06. 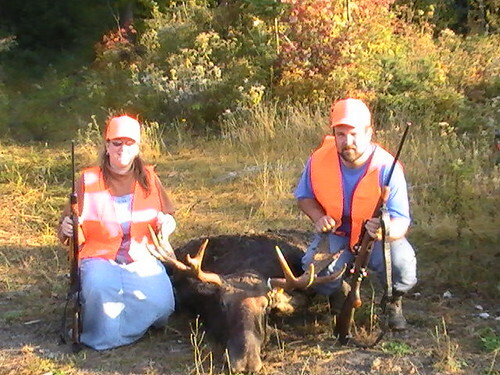 Trisha got a moose permit so Jim thought he would build a rifle for himself to take on the trip. He is the subpermitee. So check back for updates. These pictures did not do justice but you get the idea. 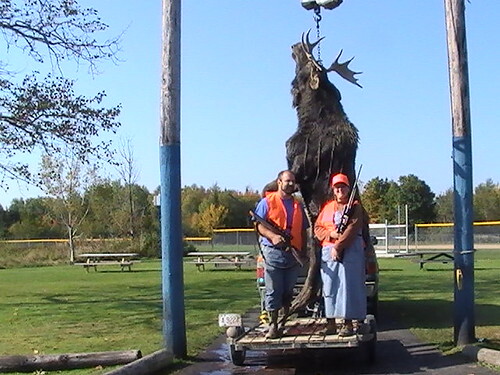 This is a photo of the moose and Jim and Trisha at the check in station, he weighed 732 pounds and his rack is 39 1/2 inches. It was a great hunt! Jim shot him with his J. White Custom 338-06, and Trisha shot him with her J. White Custom 25-06 loaded with Barnes Bullets. We were able to retrieve the bullet on the far side of the hide. The bullet doubled its size and gained a .5 grain from hide and flesh caught under the “petals” of the bullet. The Barnes penetrated both lungs. All three shots were triangular as far apart as the holes in a bowling ball. 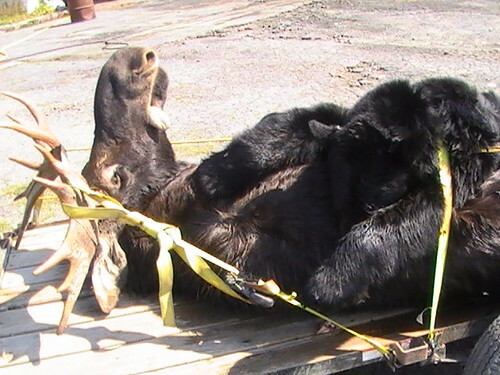 Both the bear and the moose traveling home. 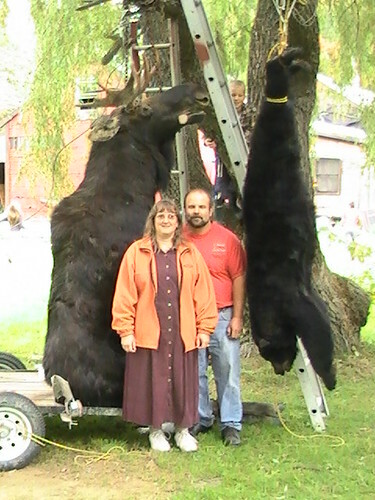 Jim and Trisha with the Moose and Bear, the Moose is sitting on a trailer and the ladder is holding the branch from snapping. Joshua shot his first deer in Atkinson around 5:00. It was a 6 point buck with a non-typical rack and weighed 147 pounds after being dressed out. Joshua is so excited!! Charles and son with their moose weighing 560. Charles Scott’s Turkey: The turkey was 18lbs with a 8-3/4 inch beard.